Comments: The traffic jam heading along the Tyne into Gateshead was sadly not going to the International Stadium – but to nearby St James Park to watch Newcastle take Rotherham apart. However on the plus side ample parking at the ground – no wonder as attendance is a very paltry 653 with probably at least 150+ being away Shots fans and probably some creative accounting to the taxman. If you’ve ever thought you couldn’t find a stand that’s further from the action you’ve clearly never been to watch Gateshead. Pitch, grass, advert hoarding, grass, long jump pit, grass, stand. Binoculars should be dished out on entry and makes s seat at West Ham look like ringside at a boxing match. I go with the mince pie – looks good glazed top, but after that it’s all down hill. 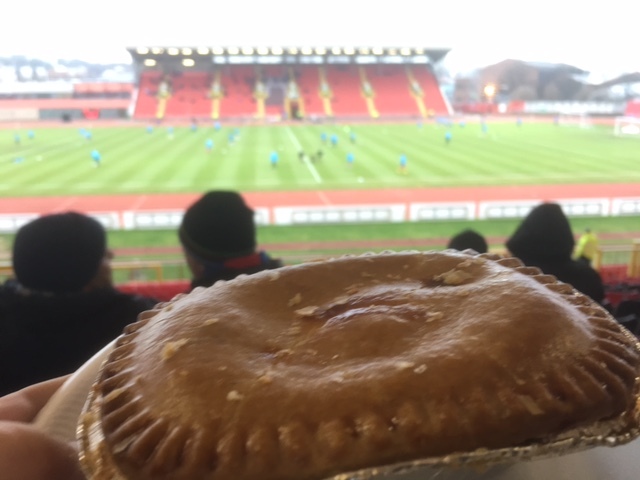 Tasteless mince, stodgy pastry – bit like the match. Two teams pushing for the playoffs neither of whom managed to be clinical as the match peter’s out into a 1-1 draw. Gateshead missing a fine open goal from 3 yards out that gets skied into orbit.